Are you a bookworm? Maybe a fan of music or movies? I guess you have in your mind many quotes you like to repeat in many situations. Some of them are especially important for you because they perfectly express your way of thinking, aren't they? I know that very well! My head is full of phrases from my favorites movies, novels and poems. Or jokes that are understandable only to my best friends. 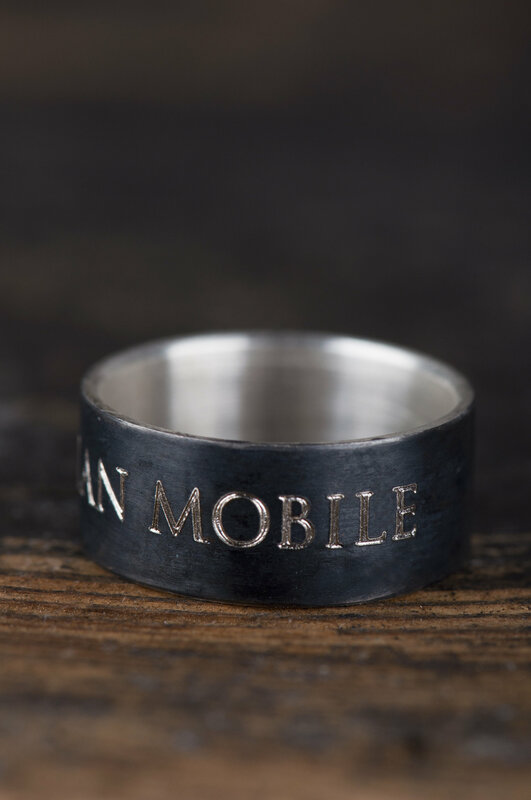 This silver band was made for my wife who admires Terry Pratchett books with a phrase which has a special meaning to us. When I made it I thought that certainly she's not the only person to like the idea of this band. 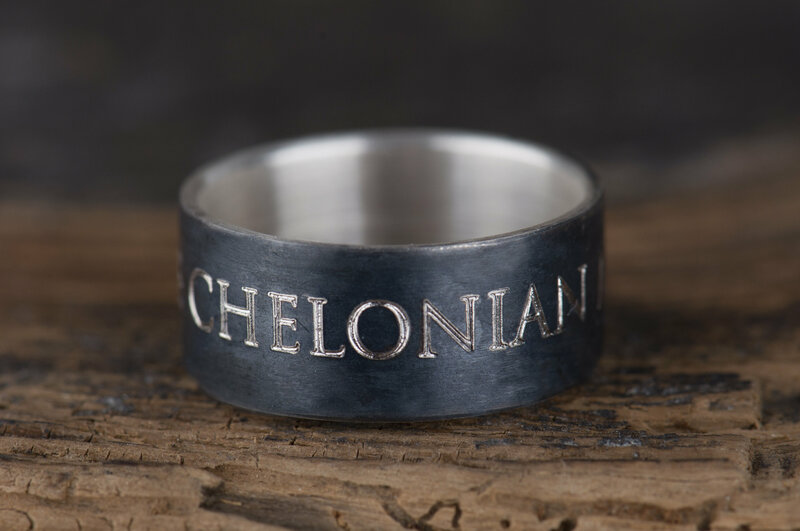 This quote ring is pretty versatile and that's why it will be a great gift on many occasions for boyfriend or girlfriend, best friend, SO, husband, wife or any other member of your family. 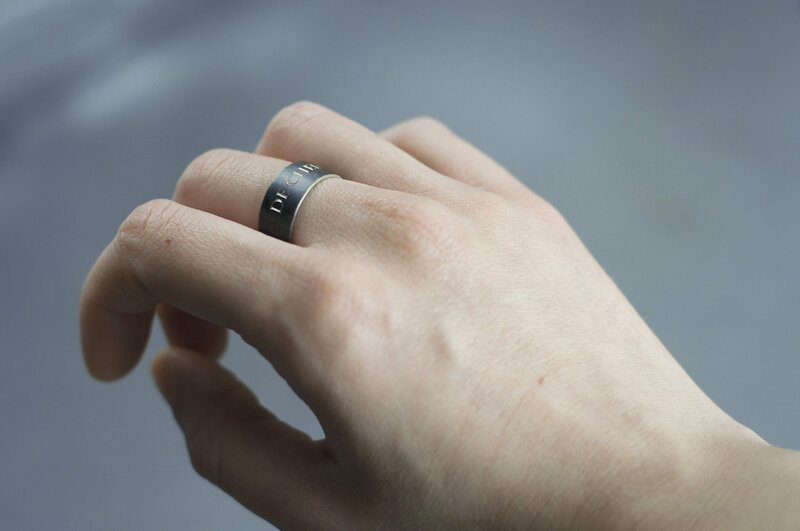 It could be also an alternative men's engagement ring or promise ring for him or for her. 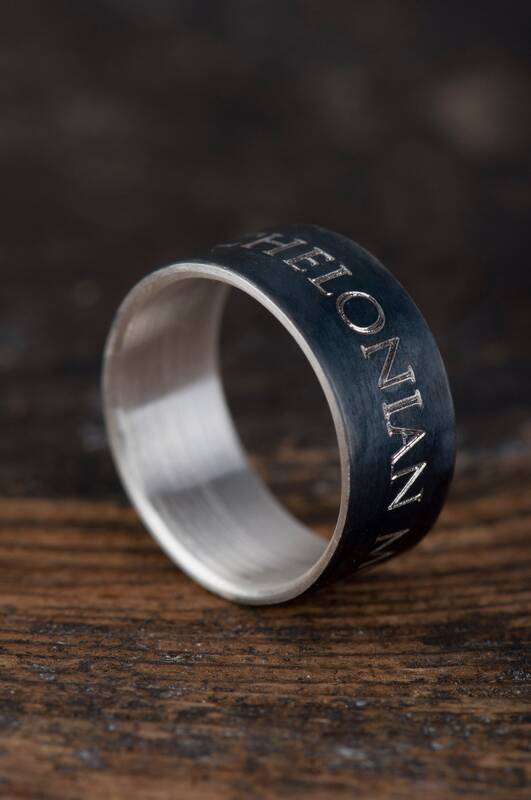 I'll gladly engrave your favorite quote from a book, poem, series, song or any other text you want to hold on your finger or give to someone close to you. * Because of limited space on the ring it's better to choose short phrase. Long text can be hardly readable. If you have any doubts on this matter please send me a message. 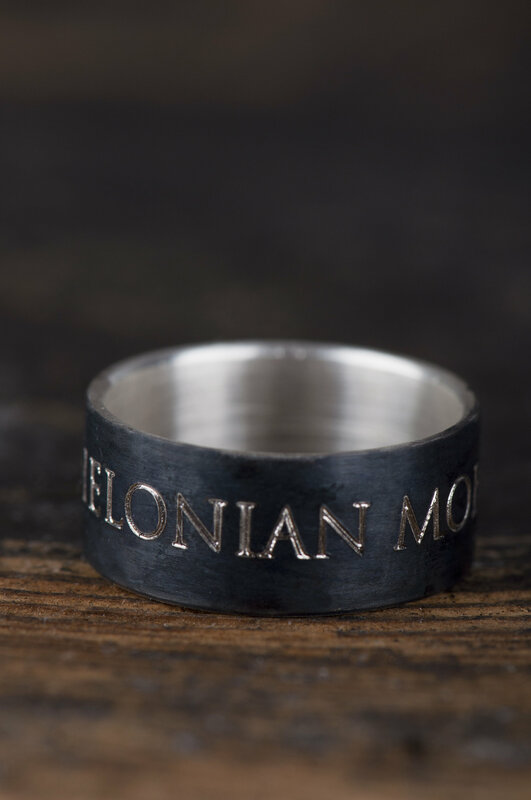 I can make a mock up for you to show how the text will look on the ring. Please keep in mind two things. 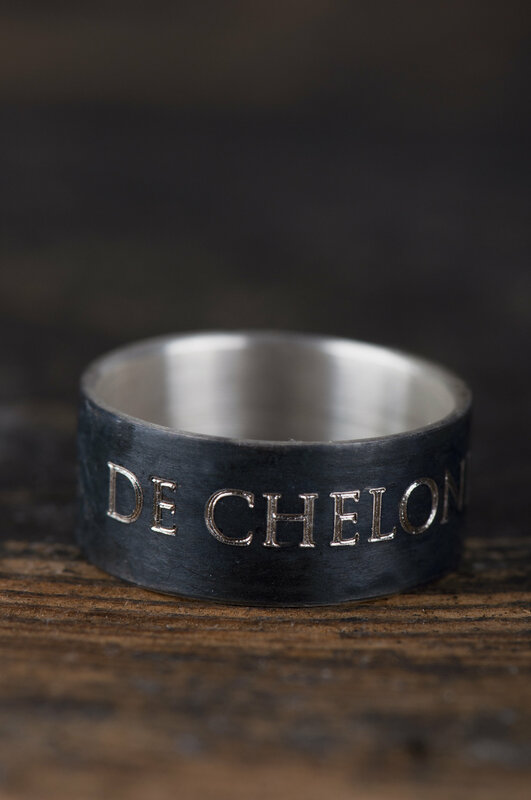 First: this band is handmade item, so no two will look exactly the same. Second: black patina is covered with a protective layer but it will change with time and become brighter on the edges and it requires proper treatment (like taking of before washing hands, protecting from cosmetics or mechanic damages). 1. The administrator of your personal information is Kevin Gajdziński, Slow Silver Jewelry owner. You can contact me via Etsy communicator, e-mail (slowsilverjewelry@gmail.com) or traditional post (address: Jerzykowo ul. Okrężna 26, 62-007 Biskupice Wlkp. POLAND). 2. I collect your personal information like: name, e-mail address, postal address, telephone number (which is necessary for sending package with courier and I’ll ask you for it in message if you chose DHL as a shipping option), payment information, details of the product you’re ordering. Sometimes I will need more personal information (for example for custom order) if you contact me directly. 3. I collect and use your personal information to fulfill your order, settle disputes or provide customer support, write an invoice or for accounting and paying taxes. 5. I retain your personal information for one year on my e-mail (as long as items guarantee is valid) and five years to comply with my legal and regulatory obligations. 6. You may have the rights to access, change, restrict my use of or delete your personal information. 7. You have also right to raise a concern about my use of your information with your local data protection authority. It’s a pleasure for me to receive custom orders. 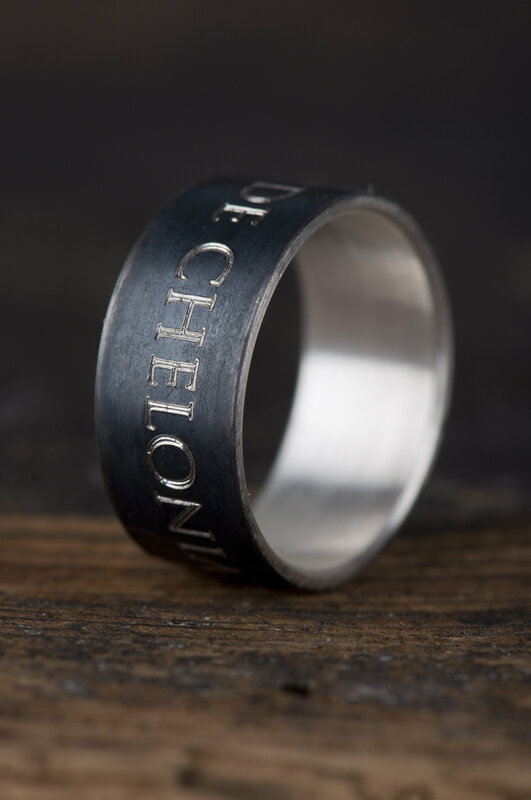 Taking part in the making something unique - a piece of jewelry designed especially for a person that is really close to you - is a great feeling. So if you’re looking for somebody who can make your jewelry dreams come true, I’m at your service. If you have any questions do not hesitate and write to me. I gladly make personalized jewelry – in my offer you can find almost every item with personalized options. It’s also a great way to make one of a kind jewelry. I can engrave on most pieces initials, names, dates or a message of your choice or even use your own handwriting on my handwritten jewelry. There are many options – if you think about something else I haven’t mention, just let me know. The month before Christmas is a busy time for post around the world. Please don’t leave ordering until the last moment, because Christmas delays are not just urban legend and they really happen very often at that time of the year and we can’t do anything about it. If you have any doubts or questions, better write to me before ordering. 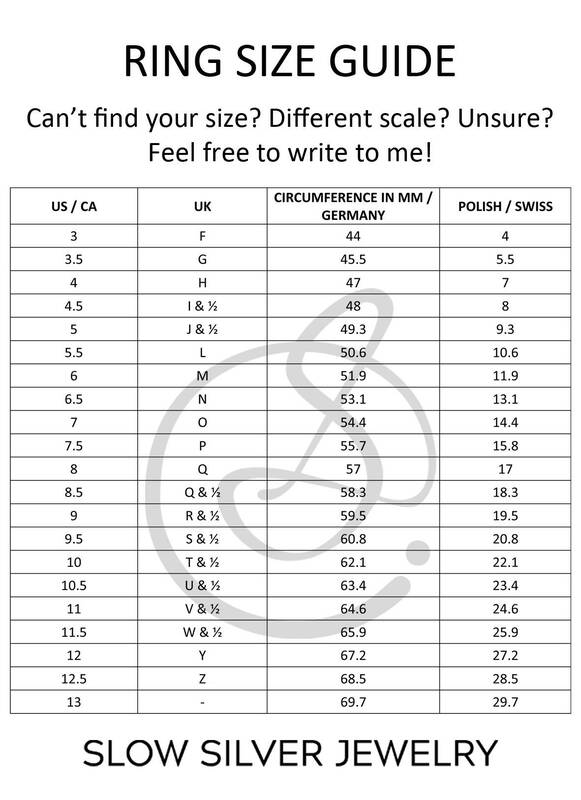 In my workshop I use standard US ring sizing, but you can send me your ring size in any other scale as well. It’s easier to make the ring bigger, whereas resizing the ring down involves the use of high temperatures, that can damage certain stones. So if you have any doubts or simply you are not sure what your ring size should be, please send me a message. You can also go to professional jeweler who will measure your size. It’s always better to ask and check twice than make an error. But even if you make a mistake and the ring you receive will be too big or too small usually there is no need to worry. 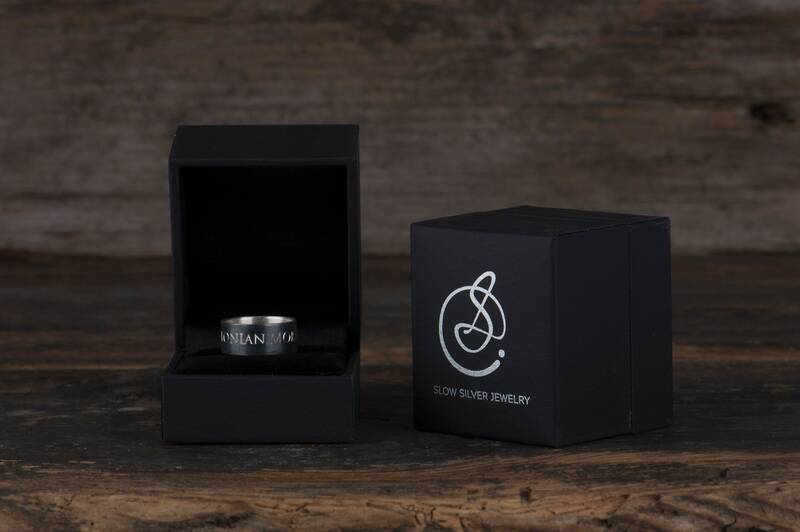 Just send the ring back to me and I resize it for free – you’ll only have to cover shipping costs. My jewelry is entirely made by hand. It means that I need time to make an item – it usually takes 3-5 business days, but some items I offer and especially custom orders have longer processing time which depends on character of particular piece and technique I use to make it. You can find information about processing time in the specification of every item. Please check it before ordering. I take great care to make sure you order is wrapped and packaged securely and thoroughly. I will send it to you in a black jewelry box which you can see on the photos of every item – the jewelry box is elegant, it has subtle satin surface and is ready for gift giving. It is also excellent for storing your Slow Silver Jewelry piece. I insert jewelry boxes into a bubble mailer envelope for their safe journey to you. I always put the return address on the package. If you wish I can send your order to another address as a gift including card with your personal message – just let me know while ordering. There are two shipping options for European customers – free shipping with DHL EXPRESS for EU countries and DHL EXPRESS shipping for non-EU countries which cost 7 USD. Package is registered, require signature confirmation and you are able to track your order. Delivery time: 1-2 business days for EU and 2-4 days for non-EU. 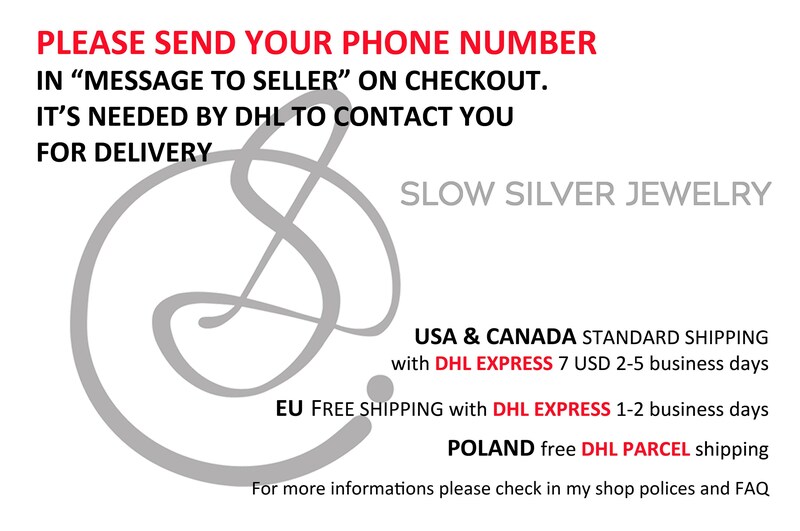 Free DHL Parcel shipping for Polish customers. I'll do my best to meet these shipping estimates, but cannot guarantee them. I ship all packages with DHL Express – they are registered, require signature confirmation and you are able to track your order, no matter where you live. Cost of this shipping is 7 USD and your order should arrive to you in 2-5 business days if you live in USA or Canada and up to 7 business days for other countries. I will gladly accept an item back with no questions asked within 14 calendar days from a day your receive it. But first please contact me within 7 days from the delivery. Kindly note, that the return costs are paid by the Buyer and the good must be received in its original purchase condition. The Buyer is held responsible for the risk of loss, insurance arrangement and costs in case the return shipment is missing or damaged. As soon as I receive the item back I’ll issue the refund. I offer 1 year guarantee on all items, but it doesn’t include accidental damage or losing your item. If something happen to your jewelry let me know by sending a message with photo and I’ll do my best to fix it. In that case you may cover one way shipping.